The Tampa Bay Lightning sent forward Jonathan Drouin to the Montreal Canadiens in exchange for junior defenseman Mikhail Sergachev yesterday. In doing so, the Bolts opened up an expansion draft protection spot that was almost certainly going to be occupied by the team's former Number-27. If Drouin and the sort of mammoth deal he signed with the Canadiens wasn't in the long-term plans for Tampa, the timing of this trade couldn't have been better. It will allow the team to protect Vladislav Namestnikov, a player who has the potential to be a cornerstone of the team's top six next year. It's admittedly a little bit difficult to get overly excited about a player who potted 10 goals and 28 points last season, but Namestnikov's situation is a little bit unique. The underlying numbers, both traditional and 'fancy', give plenty of reason for optimism. From a traditional standpoint, consider the following: Namestnikov's career shooting percentage, including last season when he converted on only 8.8% of his opportunities, is 12.2%. If you assume that he can get back to that career average mark, he's a likely a 15-goal scorer without taking anything else into consideration. If there's one thing the NHL has taught even the most casual fan over the past season or two, it's that scoring goals is hard. Players on affordable contracts who can get into that 15-goal range are valuable commodities, even if they don't jump off the stats page. Kucherov is really, really good. When he's on the ice with Namestnikov, he's even better. The chart above shows that the two together form a truly elite pair of forwards. 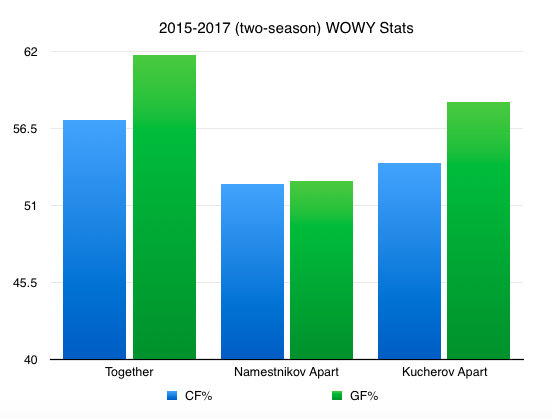 The fact that they were separated at times last season, even with Namestnikov's struggles to put the puck in the net, boggles the mind. Sure, last year's numbers when isolated were not as good as 2015-16's, but a track record such as that one speaks for itself. It's true that his goals-against per 60 minutes of 5v5 play was near-worst amongst that group of forwards, but that was largely caused by the fact that his on-ice save percentage was dead last by more than a full percentage point. That's a luck-driven statistic, and should not even be in the realm of a reason to be concerned. The reality is, when Namestnikov is on the ice, the Lightning are a low-event team in the defensive zone and a high-event team in the offensive zone. That's a special combination. The big takeaway here is this: While the goals and assists weren't always there for Namestnikov last season, the track record of underlying numbers gives reason to believe that next year can and will be better. If low production was coupled with devastating figures in other areas, there'd be cause for concern; it wasn't last year, and it hasn't been since he made the jump to the NHL. This is a player worth keeping around. The only thing left to do now is hope that Lightning GM Steve Yzerman sees things the same way, and remembers to check off Number-90 on his expansion draft protection list before tomorrow's deadline. The trade of Jonathan Drouin certainly comes with a level of pain, but the side effect of being able to keep Namestnikov is one heck of a consolation prize. Cited statistics are courtesy of either stats.hockeyanalysis.com or puckalytics.com, two premier sources for hockey analytics.